The live music scene in Newtown has it's ups and down, but right now it's buzzing. It's great to see a free live original band at the Town Hall Hotel on a Saturday night. We're making a point of enjoying the ye olde Newtownian delights of the Townie (downstairs please) before some arsehead like Justin Hemmes buys it and turns into a glossy Scruffy Murphys. And where there's live music there's beer. And after a few beers, generations of Newtown residents and musicians will tell you there's nothing like Saray's Turkish Pizza. We sorely miss Saray's pre-renovation grungy 1970's vibe, but the new lick of paint does make it cheerier. The old dude with the mo' (we call him 'The Master') is still working but we're glad to see he is taking it easy and letting the younger folks in the family take the brunt of it. He's taught them well. 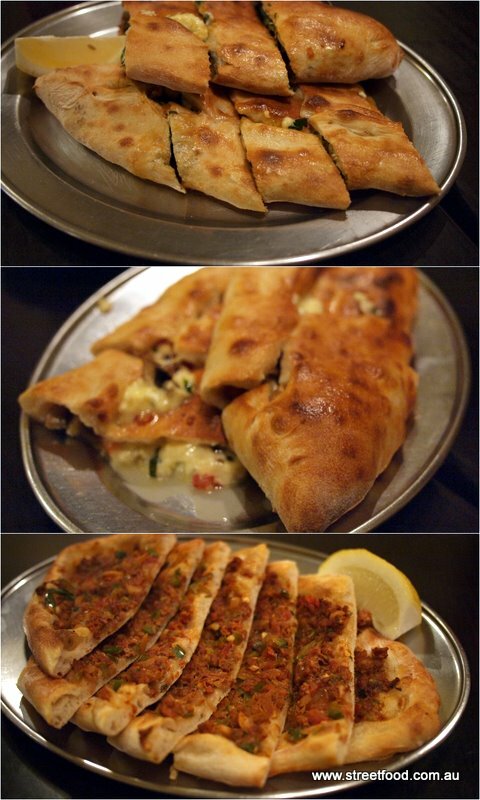 The folks at Saray have a magic touch when it comes to pide. We don't know how they do it but the dough has an amazing light and delicate texture, always perfectly cooked and filled. We have been coming here for years for post-pub feeds and can't go past the Kiymali (a flat open pizza with lightly spiced ground meat); mushroom and cheese (super cheesey beer soaking goodness); and the Sucuklu (Turkish sausage plus cheese). The Turkish sausage is made in house and varies in heat from batch to batch. We're also big fans of the pide at Sultan's Table down the road: we prefer Saray's on beer nights and Sultan's Table on school nights. Sadly the other pide joint Topkapi has shut it's doors for good, they were such nice folks in there. After a feed we see legendary New Zealand band The Bats play at Notes across the road. Which has nothing to do with food, except that after the gig and getting kicked out of the Queens we discover Garlo's Pies in Enmore has closed down, no more 2am meat pies with sauce - oh the horror! Saray Turkish Pizza is at 18 Enmore Road, Enmore, not far off King Street. RIP Garlos Enmore and Topkapi. "We're making a point of enjoying the ye olde Newtownian delights of the Townie (downstairs please) before some arsehead like Justin Hemmes buys it and turns into a glossy Scruffy Murphys."